Today’s world is noisy. And I’m not just talking about heavily populated demographics. The entrepreneur nurse must produce GREAT content if they want to stand out from the crowd. If you’re new to the online space, when we say the word “content” we mean all things that help you communicate with your budding or current tribe. This could be a blog post, podcast episode, or live streaming video. Content is how you get your message out to the audience that you are working to get in front of. And yes- while we discuss content you may start to panic with the many technological components that come into play. Not to fear! The entrepreneur nurse is often creative and tech savvy. And, trust me… today’s software and other supports that exist smooth that technology learning curve so that many more people can play!! There are times when you may have to invest in a tool or piece of equipment in order to create and produce content for your audience. For example, as a podcaster, I had to get a microphone and some equipment to record the episodes. However, that was a one-time purchase and something that I have used over and over again… definitely got my money’s worth! Other types of tools may come in the form of applications or plugins on your website. Many of these are free to use- making it much easier for the entrepreneur nurse to start up online! No Exceptions to the Rule! There are certainly some pieces of content that you will need during start up mode. And other items that you can wait until you are a more established entrepreneur nurse before diving into. Where does your target audience hang out? Which social media platform will you find the majority of them on? What type of content do you enjoy producing? Are you a writer, talker, or video queen? You don’t need to be on ALL platforms right out of the gate. Which type of content can you deliver on a consistent basis? The name of the game for any entrepreneur nurse who is starting a business is consistency. Your audience needs to get into a rhythm of where they can expect to find you and when you will be there. If getting all dolled up for a YouTube video is something that will take lots of time and you won’t do on a regular basis, then you may not want to begin there. What type of content can you afford in the stage that you are at? I’d like to introduce you to one of the best nurse entrepreneurs I know, Christy Hendricks. In fact, this isn’t the first time you have met Christy as she was a guest on episode 131 of the Your Next Shift podcast. Christy is a business and marketing consultant for nurse entrepreneurs. She is the owner of Change of Shift, the name of her site and online school, where she provides training and resources for nurse entrepreneurs in business start-up, strategic marketing, branding, and expert positioning. Visit Christy and check out her course, The Nurse Entrepreneur’s Briefcase, by clicking here. Get Started with Your Nurse Entrepreneur Ideas Today! What’s awesome about Christy is her love of helping other people, specifically nurses. Christy not only coaches budding entrepreneur nurses- she supports nurses by teaching them how to set up an online business. If you’ve been thinking about the next shift in your nursing career– here’s your chance to make it happen! 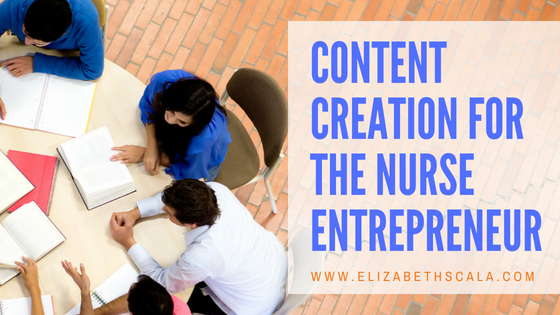 Take the first step and explore content creation for the entrepreneur nurse. Tell her I sent you and enjoy this next chapter in your nursing career.